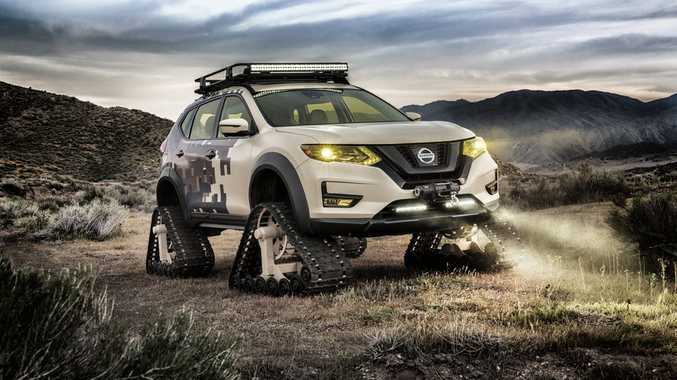 MAD: Nissan Rogue Trail Warrior Project concept car compete with snow tracks and special camo exterior wrap. FANCY trying a few different modifications on your Nissan X-Trail? Americans call the model the Rogue, and in facelifted guise the Nissan team has created this rather mad Trail Warrior Project featuring a full snow track system and special camo exterior wrap. On display at this week's New York Auto Show, the one-off project also boasts military-style yellow lights, modified suspension and wheel wells, custom fender flares, ARB Gear Basket and a winch kit. Most spectacular are those snow/sand tracks however. Known as Dominator Tracks from American Track Truck they are 48-inches long, 30-inches high and 15-inches wide. Despite all the modifications the Rogue's drivetrain components, including its 2.5-litre four-cylinder engine and gearbox, are standard Nissan factory issue. We'll see the facelifted Rogue in Australia next month with its usual X-Trail badge, but sadly, you can't order the Warrior Project kit to help you through Australian city traffic.